While data breaches by hackers get headlines, another form of data leakage can be very damaging to a company's bottom line, too. Most notably, that is sensitive data lost on the USB memory sticks. That was evident in a study released today by the Ponemon Institute, of Traverse, Mich. Ponemon estimates that the more-than-400 organizations studied in the survey will lose as much as $2.5 million because of missing memory sticks. On average, the companies lost 12,000 customer, consumer, and employee records on missing USB sticks, the study explained. At an average cost of $214 a record, that amounts to losses that could go north of $2.5 million for the companies in the survey. "While these devices may be small," the study said, "the data breaches that can result from lost or stolen USBs are huge. More than 70 percent of respondents in this study say that they are absolutely certain (47 percent) or believe that it was most likely (23 percent) that a data breach was caused by sensitive or confidential information contained on a missing USB drive." 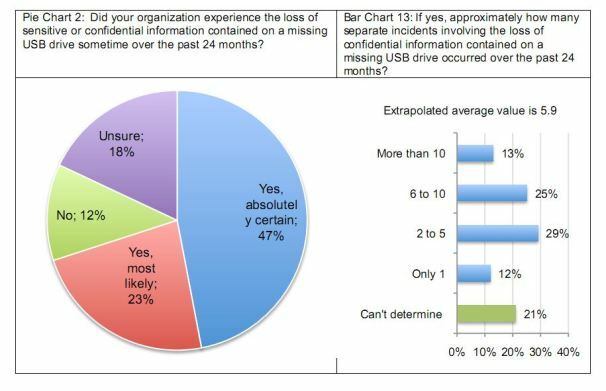 In addition, nearly half (47 percent) the 743 IT and IT security practitioners in the study said they were "absolutely certain that their organization experienced the loss of sensitive or confidential information on a missing USB drive during the past two years," as shown in the chart below, which appeared in the Ponemon report. Despite the dangers USB sticks pose to organizations, security surrounding the devices remain lax, the surveyors found. "We believe the lesson to be learned from the research is that organizations do understand they are at risk because of employees’ negligence, but are not taking the necessary steps to secure USB drives," the study reported. “The main reasons cited for not being proactive include: Uncertainty about monitoring and tracking USB use in the workplace, desire not to diminish productivity, and the reliance on employee integrity and trustworthiness." Findings in the survey suggest that trustworthiness may be misplaced. For example, it found that free USB sticks from conferences, trade shows, business meetings, and other events were used by 72 percent of the workers in the surveyed organizations, including organizations with policies mandating the use of secure USB sticks. Those findings are similar to those revealed in a U.S. Department of Homeland Security experiment, where USB sticks were sprinkled in the parking lots of government buildings and private contractors. In that case, 60 percent of the people who picked up the sticks plugged them into their computers at work. The survey also discovered that half the respondents in the study use USB drives without obtaining advanced permission all the time. What's more, almost half (49 percent) of them lose their USB sticks without notifying the appropriate authorities about the loss. John Terpening, secure USB business manager for memory stick maker Kingston, told PCWorld: “This study shows that most organizations are not taking the USB port and portable storage serious enough." Kingston sponsored the study. 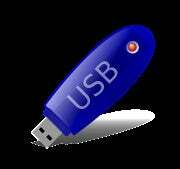 Lost data isn't the only security problem posed by untrammeled use of USB sticks, Terpening added. "Malware is also a perceived likely cause of some of the theft of confidential data." According to the survey, 74 percent of the respondents revealed that their organization does not have appropriate technologies to prevent or quickly detect virus or malware infections that may reside on USB drives before use by employees in the workplace. “An unsecured USB drive can open the door for major data loss incidents,” Larry Ponemon, chairman and founder of the institute that bears his name, said in a statement. “Organizations watch very carefully, and put a plethora of controls around, what enters their businesses from cyberspace," the Ponemon statement added. "This study drives home the point that they must also take a more aggressive stance on addressing the risks that exist in virtually every employee’s pocket." This article was updated on 8/9/2011 at 9:30 a.m.